The patio is filled with diners at Hops Culture in Aspen Friday. Occupancy in lodges and hotels is strong this weekend, but advance bookings are down from last year for June overall. Aspen’s tourist accommodations were crammed Friday night because of the Food & Wine Classic, but the lodging industry’s advance reservations are disappointing overall for the month in Aspen, although they are stronger in Snowmass Village. The Food & Wine Classic provided a good mid-month surge after a slow start to the tourist season. 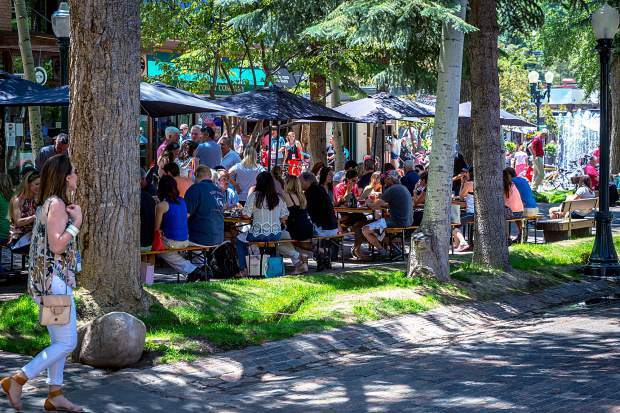 The month will finish strong thanks to the Aspen Ideas Festival starting Thursday, according to Bill Tomcich, president of Stay Aspen Snowmass, a central reservations business. The reservations on the books for June as of May 31 were down 9 percent for Aspen compared with the same time last year, according to Tomcich’s research. Bookings in Snowmass Village were 23 percent ahead of the same point last year. The improving weather could draw more visitors to Aspen for the last half of the month, he noted. Reservations on the books in Aspen as of May 31 would produce occupancy of 49 percent. Even with the big increase year to year in Snowmass, its paid occupancy is still only 36 percent for June. When the occupancy of the two towns is combined, they are nearly “dead even” with June last year, according to Tomcich. Snowmass Village has been marketing aggressively, and it has rooms available at lower rates than Aspen. For example, rooms were starting at $234 per night at the Westin and $350 per night at the Viceroy based on double occupancy for Saturday and Sunday. In Aspen, rooms were starting at $855 at the Hotel Jerome and $874 at the St. Regis for double occupancy on Saturday and Sunday. The Limelight’s rates started at $415 for that period, while the Molly Gibson Lodge was at $386, according to Stay Aspen Snowmass. Rates came down as the weekend neared. Next month is already shaping up to be busy. Thursday through July 4 is approaching a sell-out for Aspen’s lodging industry, in large part because of the Aspen Ideas Festival, according to Tomcich. But the strong numbers carry through July. Advance bookings look strong throughout Western U.S. mountain resorts, according to DestiMetrics, a resort travel research organization that tracks reservations and occupancy for member resorts. June bookings are pacing at 4 percent higher than last year, the company said. Resorts are trying to tap the potential of summer business by expanding their recreation options and jamming calendars with special events, according to DestiMetrics Director Ralf Garrison.